Australian RESET Challenge winner Anne Letier believes the USANA products have definitely changed her life and health. She said USANA has taught her to have some freedom in life and also to be fit and healthy. Before joining USANA, Anne Letier worked in an office. She spent most of her day sitting down and was inactive for the lengthy trips to and from work. Anne also made poor choices when it came to food, this had a huge impact on her health and she knew something had to change. Anne said she had wanted to lose weight “for a very long time” and “chase the dream” of having the ‘perfect body’. Anne, who comes from Mauritius, said a lot of the cultural food she eats is delicious but involves deep frying, large amounts of meat, oil and sodium-rich sauces. “After spending a six week holiday with my family in Mauritius, I made poor choices with food and ended up gaining extra weight. From the moment I arrived back home to Australia, I decided I desperately needed to make a change with my health and my weight,” she said. 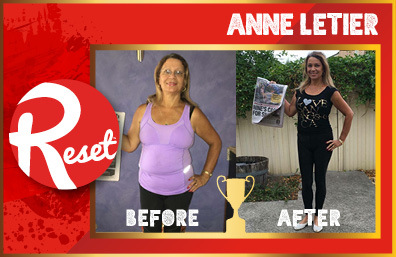 Anne said after reaching that point she began on the RESET Challenge practically right away. “I had used the USANA Nutrimeal range and the snacks many times previously and I had always found them delicious and satisfying to my hunger but it was going to be my first time eating the products consistently for a long period of time,” Anne said. Anne said at times, she blended the Nutrimeal products with fresh fruit and stepped up her exercise routine, involving a lot more cardio including more intense runs on the treadmill and longer walks with her husband than she could ever manage to do before. Anne said at her age she knew she needed to greatly improve her health and is “incredibly happy I completed the RESET Challenge”.